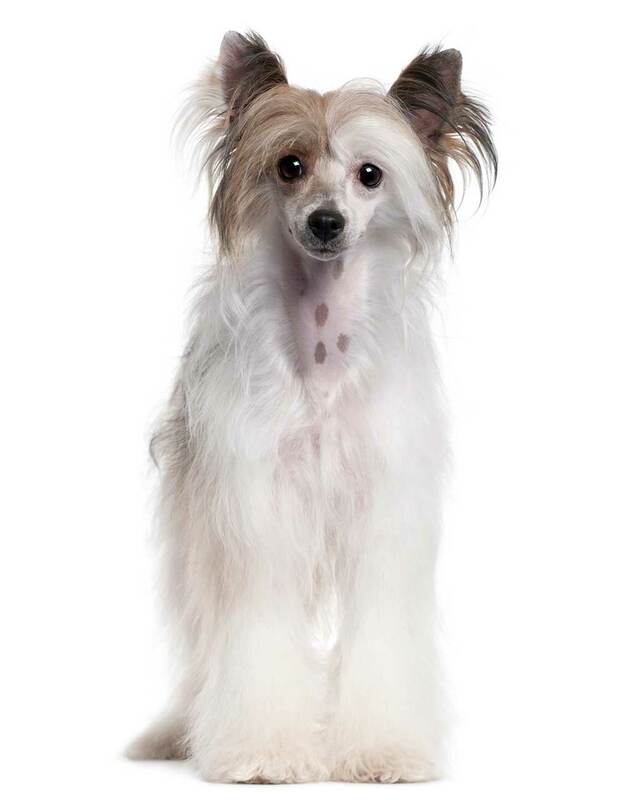 The Chinese Crested is a notoriously ugly (winning the Ugliest Dog competition every year) and tiny dog with a huge heart. This breed is descended from hairless dogs in Africa (or, some historians argue, from Mexico), and exist in two varieties: the Hairless Crested is more common, and has thick fur on its head, legs, and tail, with otherwise smooth skin (or mostly so). Due to a recessive gene in their DNA, some Cresteds have a full double coat, and are called Powderpuffs. Both varieties are lively, alert, and affectionate, and require a lot of attention from their owners. They also need a good deal of care and maintenance, and are recommended only for pet owners willing to give them a lot of treatment – of both the physical and emotional type. Below are details and specs on the Chinese Crested dog breed. A small-sized breed, Cresteds (both males and females) weigh 5-12 pounds, and are 10-13 inches in height at the shoulders. With personalities as complex as their bodies are tiny, these dogs are affectionate, needy, sometimes stubborn, and always devoted. They show great love to people and animals whom they know, and will suffer separation anxiety if left alone; conversely, they are timid and defensive around strange humans and animals. (But for what it's worth, they make excellent watchdogs). With early socialization, this breed will be a fun-loving, personable addition to any family. Cresteds require a good deal of care. Both the Hairless and Powderpuff varieties will need a lot of grooming (with extra attention paid to the Hairless' skin), though neither variety sheds much. Not much exercise will be required for this breed, but some training, particularly in the housetraining area, will be necessary. 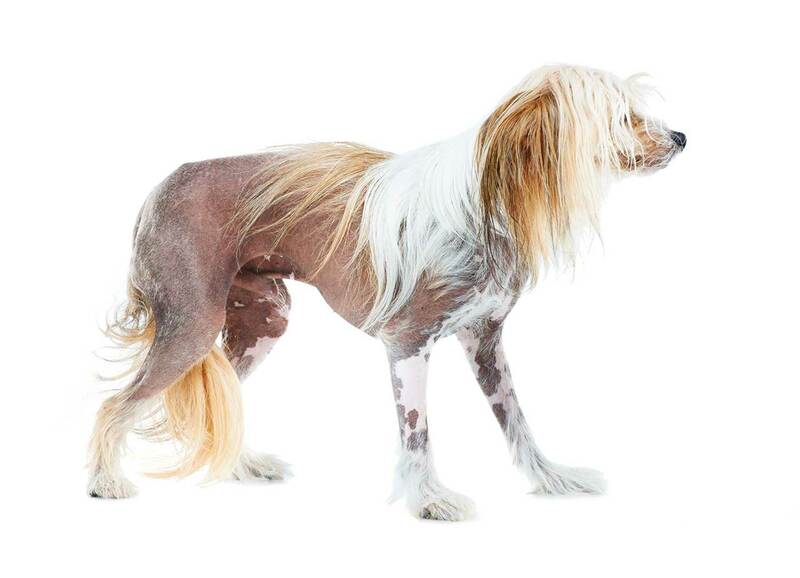 This breed is believed to have descended from hairless dogs from either Africa or Mexico (and perhaps both); dog historians still debate the Crested's true lineage. In any case, Chinese sailors are believed to have begun breeding these dogs as early as the 1500s in an attempt to develop a smaller-sized breed to be used as rat-hunters on Chinese ships. According to historical documents, these dogs served a variety of purposes to these Chinese seamen: in addition to hunting vermin, they were used as "heating pads" for ailing sailors, and in desperate times they were even served as meals. Through the centuries, the sailors traded these dogs with merchants in port cities around the world, so the population of the Crested eventually spread across the globe. Though it is unclear exactly when this breed arrived in North America, records show that Cresteds participated in U.S. dog shows in the late 19th century. During the 1900s, the breed's popularity grew in the U.S., in part because of the noted Burlesque dancer Gypsy Rose Lee, who promoted and bred Cresteds during the mid-20th century. 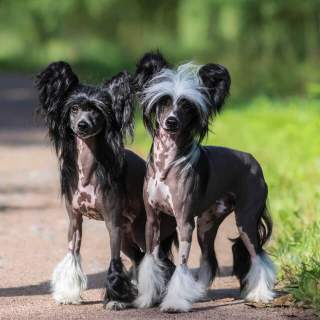 The Chinese Crested – both the Hairless and Powderpuff varieties – were officially recognized as a single breed by the AKC in 1991. This breed has two varieties of coat. The more common Hairless has thick hair on its head (called its "crest"), its feet and legs (its "socks"), and its tail (or "plume"); even though it is classified as "hairless," this variety has a small to moderate amount of hair on its body. The less common, full-haired Powderpuff variety, which is hairy due to a recessive gene, has a soft, silky, double coat. The two variants are otherwise nearly identical, and are usually found within the same litter. A Crested's tiny body is fine-boned and elegant, and is usually a bit greater in length in proportion to height. The head is wedge-shaped, eyes are usually almond-colored (but a few have blue, hazel, and even green eyes), and the ears are large, triangular, and often erect. (Some have hanging ears, and many owners "tape" a puppy's ears for several days to have them naturally stand erect as the dog matures.) The neck is lean, the chest is moderately deep and tapers a bit at the flanks, and the legs are straight and fairly long, with noticeably narrow feet and long toes. The breed's tail is long and slender, and often has a J-hook at the end. 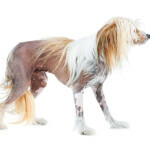 Both the Hairless and Powderpuff varieties have a wide (and interesting) variety of hair colors, including apricot, black, blue, chocolate, cream, slate, brown, red, sable, and white; some dogs can have combinations of two or three of these colors. A Hairless Crested's skin can be gray, lilac, pink, and even spotted or "palomino." For some reason, this breed's fur may change colors (often more than once) during its lifetime. A small-sized breed. Normal weight for both males and females is 5-12 pounds; height is 10-13 inches. 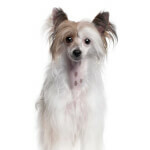 There are two variations of this dog breed: the Chinese Crested powder puff and the Chinese Crested hairless. The hairlessness is a genetic mutation that has been promoted via breeding practices over the centuries. Chinese Crested hairless puppies tend to dominate litters where at least one of parents carry the hairless gene. The powder puffs can never be bred out, however, because all Chinese Crested dogs have the ability to produce them. 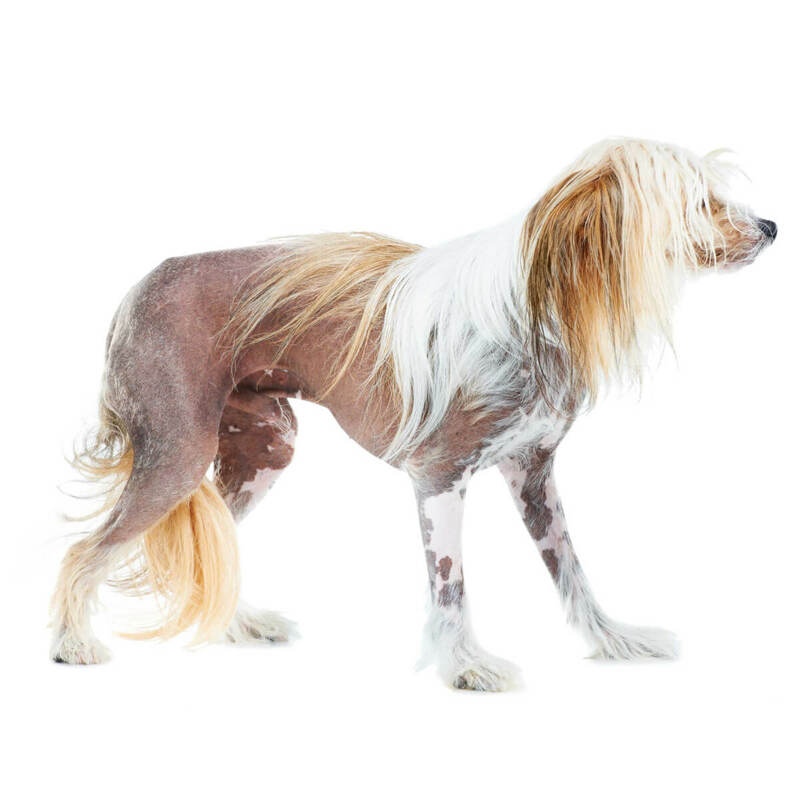 Although they are called hairless, these dogs may have a very short coat. They will often have some fur, typically on their head, paws, and tail. Of course, they may have nearly no hair, and these are called a true hairless. They may also have a very dense hair where there is a coat, but it will always be a single layer. Regardless of the range of hair on a hairless, they will almost always have"dentition." This term means they have fewer teeth. The Powder Puff type has a double coat of silky hair that is soft and straight, and they have all their teeth. As for size variations, there basically are none. This is a toy breed, and there are sure to be smaller ones. Still, it's considered incorrect to call them miniature, teacup, micro, etc. Lively, affectionate, and sweet-tempered, many Chinese Cresteds are known as "Velcro dogs," because they physically attach themselves to their owners' sides – and are difficult to remove. These toy-sized dogs are intelligent, happy, devoted animals whose personalities can be as unique as their appearance. They are extremely social (but mainly to their owners, as Cresteds can be suspicious of and standoffish to strangers), highly sensitive, and at times stubborn. Experts suggest early socialization with strangers and other animals, along with obedience training (to which they normally respond well), to teach a Crested to behave properly in assorted situations. Cresteds also form intense bonds with their owners, and will likely suffer high separation anxiety if left alone for extended periods, which can lead to destructive behavior. And though its tiny size probably won't scare off a burglar, this breed makes an excellent watchdog, and will "alert bark" when unknown people, animals, or objects come near. That said, Cresteds are not frequent "barkers"; they normally don't bark without good reason. They're more likely to howl – fortunately, this happens most frequently when they're happy. Cresteds are also notorious "Houdini hounds," in that they can escape from an amazing array of places. They are known to climb tall fences (or just dig under them), and are extremely difficult to catch once they're free. In addition, Cresteds are notoriously difficult to housetrain. Males in particular, especially non-neutered ones, will urinate in random places to "mark their territory." 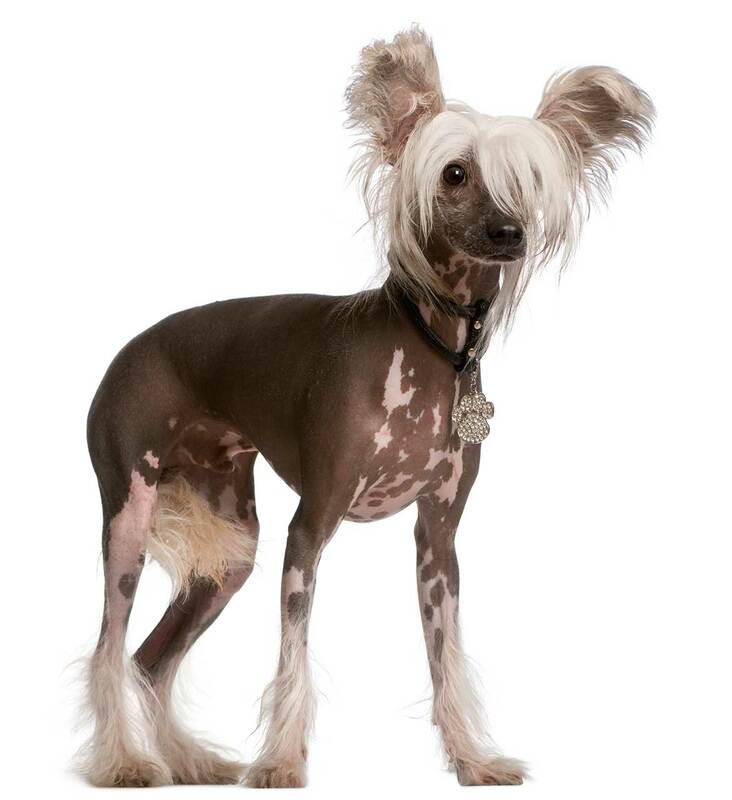 Provided the dog knows them, a Chinese Crested will treat kids with exceptional love and affection. The breed will likely be suspicious of, and possibly aggressive towards, an unknown child. 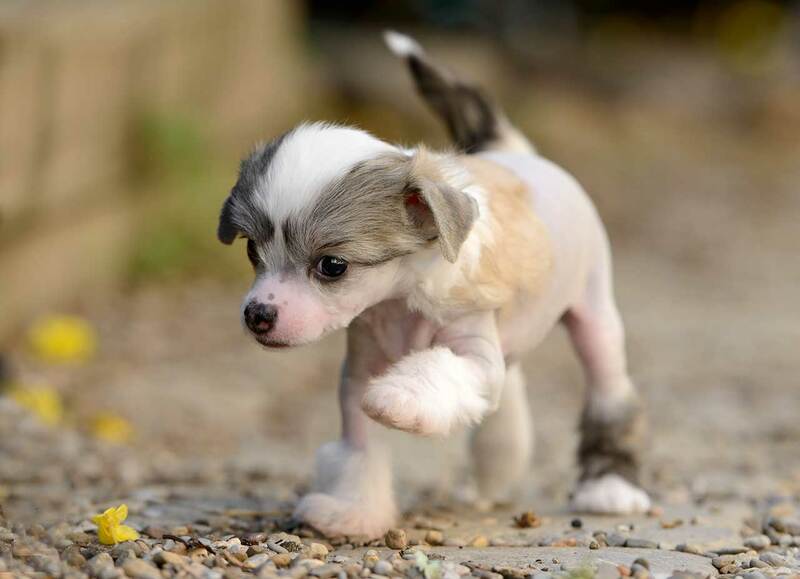 And it is recommended that smaller children are closely supervised with these dogs; because of their small size and fragile makeup, Cresteds can be easily injured if accidentally stepped on, squeezed or dropped. 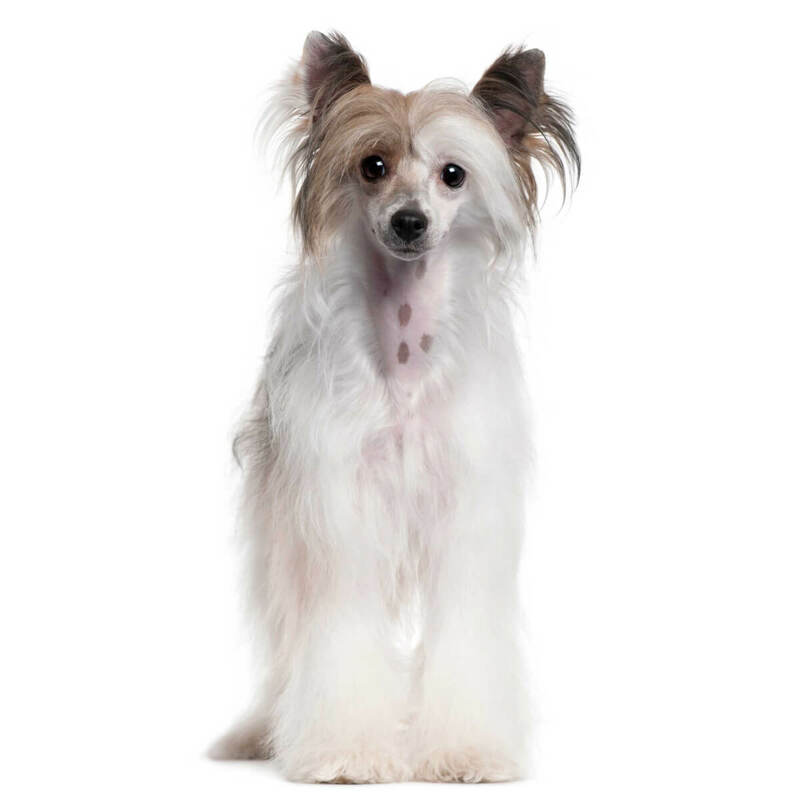 This breed is very good with other pets, and will likely be very playful with them; because of its neediness, a Chinese Crested may get jealous if other pets are shown more attention by its owners. Cresteds are normally reserved around and suspicious of strange people, and may be aggressive towards them. Early socialization with unknown people is recommended to teach these dogs proper treatment of strangers. 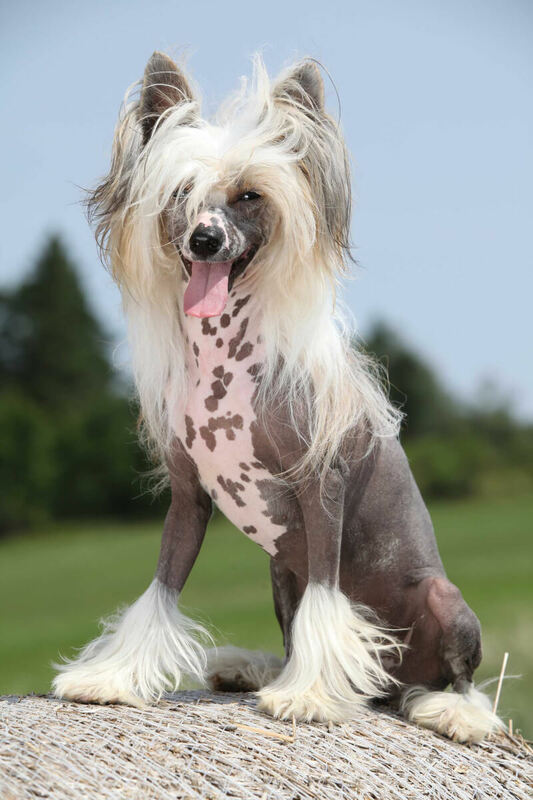 Below are pictures and images of the Chinese Crested dog breed. 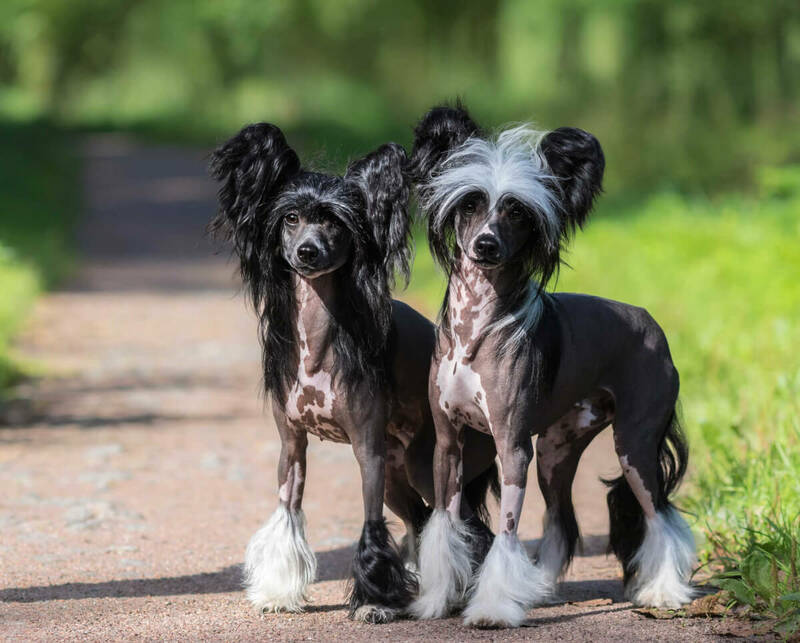 The Chinese Crested is a fairly high-maintenance breed. 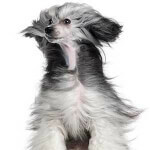 Quite a bit of grooming is necessary, with some additional skin care for the hairless variety; some training, including early socialization with people and attentive housetraining, will be required; only a moderate amount of exercise is needed. The Hairless and Powderpuff varieties require differing methods (and frequencies) of grooming. As previously mentioned, a Hairless Crested is not truly "hairless," but professional groomers recommend shaving any hair on a Hairless Crested's skin with clippers to keep it healthy; a Hairless's head, feet, and tail furnishings can be trimmed to the owner's personal preference. The skin should be monitored closely for problems like acne and other irritations; a Hairless should be bathed often (at least once per week), using a high-quality, moisturizing shampoo, to keep the skin in good shape. Some owners recommend using sunblock to protect a Hairless's skin from sunburn, while others say the sunblock acts as a skin irritant; consulting a veterinarian about an individual dog's skin care is a good idea. Powderpuffs, because of their full coats, require frequent brushing (3-4 times per week) to keep the coat smooth and healthy, but do not need frequent baths. (Every 4-6 weeks should suffice.) Like the Hairless, the Powderpuff's coat can be clipped – either at home or by a professional groomer – to the owner's liking. This breed doesn't require a lot of exercise, but will need mental and emotional stimulation. 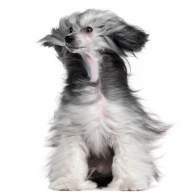 Inside play is generally adequate to meet their needs; an hour-long daily walk, always using a leash, is recommended. These dogs are suited for any type of living, and due to their small size are highly recommended for apartment owners. A word of warning: Cresteds are amazing escape artists. Close supervision is highly recommended if this breed is kept in a fenced yard – otherwise, the dog will always find a way to get free. Cresteds are much more suitable for warm weather; the Hairless variety in particular will suffer badly in cold climates. Use of a doggie sweater, especially for Hairless dogs, is highly recommended for outings in cold temperatures. 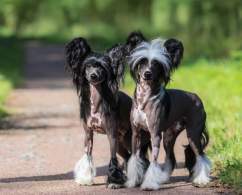 Most people consider the Chinese Crested to be an ugly dog-- this makes the all the more appealing to potential owners and current fanciers of the breed. Don't believe us? 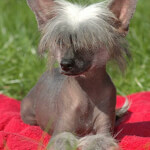 The Chinese crested has won the ugliest dog award 11 times! The contest is called the "World's Ugliest Dog Contest" and it is held every year as part of the Sonoma-Marin Fair in California. 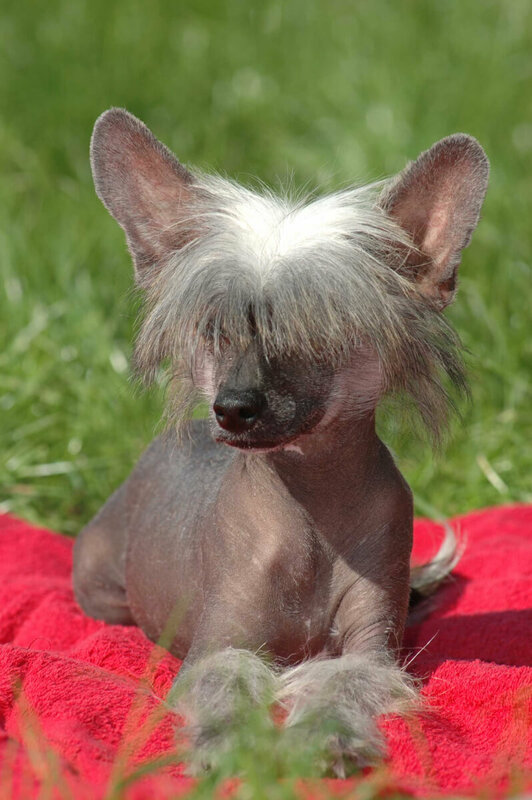 The Chinese Crested has won 11 years from 2000-2018 with one particularly ugly Chinese Crested, Sam, winning 3 years in a row from 2003-2005. Life expectancy is 13-15 years. Chinese Cresteds may have one of several health issues including deafness, eye problems (lens luxation and glaucoma), and epilepsy. Interestingly, dogs of the Hairless variety are known for loose and/or missing teeth, and may require extra dental care.